Whether you are starting seeds outdoors, or transplanting new seedlings into the garden space, it can be easy for gardeners to mix up what went where. That's why we love garden stakes or plant labels to help remind you what you planted and where you planted it in the garden! This collection of DIY plant markers is perfect for an outdoor garden space. These garden markers are super awesome because they are so visual! This project from The Untrained Housewife allows you to reuse canning lids, so if you are a home canner, you probably have extras of these every time you open a new jar of jam or home-canned veggies! Turn them into garden label stakes that are highly visual and last a full season. You can reuse the lids by simply adding a new circle label each year. These painted rock labels from Creative Green Living are great for a low-profile addition to the garden space. These are also perfect for letting kids feel involved in the garden process, so they can help create the garden markers too. Even if they aren't old enough to paint the words on the rocks, they can paint the rocks different colors and then the adults can do the words. We love the rustic look of these stakes from Wendy Piersall at WooJr, and the beautiful marble toppers would catch the sunlight in a really lovely way. The stakes are a little bit longer, so the label will stand up higher and be more readily visible. 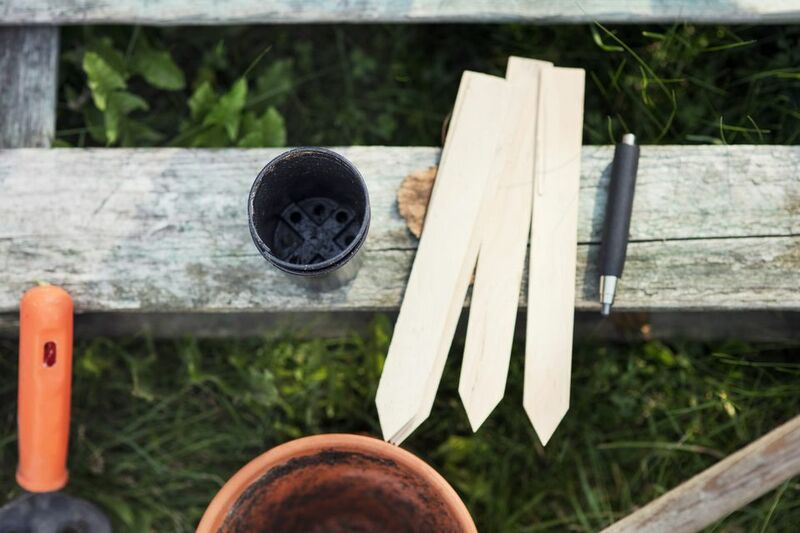 Sometimes once a garden begins to grow out, it's easy to lose sight of the garden markers, so this DIY is a smart way to avoid that problem. These hand-painted blocks of wood from Not Just a Housewife would be an excellent way to reuse scrap lumber pieces. Kids helped paint the examples in this DIY, which is great because it shows just how simply you can make some of these plant markers. You don't have to be a fabulous artist to create a homemade touch in the garden. These wouldn't be reusable unless you painted over the design from last year, although a colored background would be lovely, so that's very possible. This project from Creative Green Living is a great way to reuse can lids if you have a can opener that opens cans without creating sharp edges. If you use a traditional can opener that leaves sharp edges, we wouldn't recommend this DIY. This is an awesome way to upcycle in your garden! Using simple clay and cookie cutters for the basic shapes, this project is easy enough for the whole family to participate in. 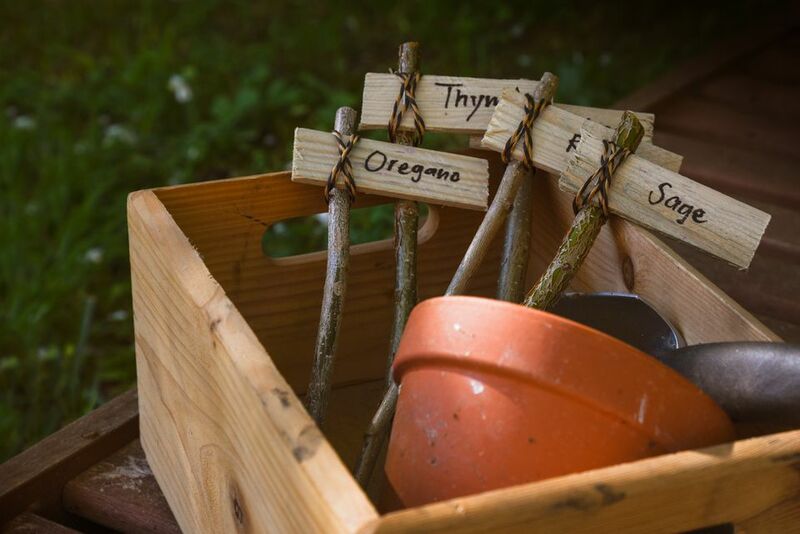 Once you stamp out the labels, put them on stakes and add them to the garden! They look beautiful and simple. Almost everyone has a handful of those cheap wooden paint stirring sticks that you get with a paint purchase lying around the garage. And if you don't, they are easily picked up at any hardware or home decor store. This is a simple DIY from Blissfully Domestic that uses those sticks as sturdy and colorful garden markers for a bright and vibrant garden area.